For a guy who claims to have nothing to do with the Muslim Brotherhood, Imam Shaker Elsayed dedicates a surprising volume of his Facebook page to the Egyptian Islamist group. Elsayed, head of the Dar al-Hijrah mosque in Falls Church, Va., features a picture of deposed Egyptian President Mohamed Morsi – the Brotherhood's candidate in 2011 – across the top of the page. Teenage girls post smaller images of Justin Bieber. In the corner, Elsayed features a dark green variant of the Brotherhood's symbol of opposition – the R4BIA hand – emblazoned with the Muslim Brotherhood's motto: "Allah is our objective. The Prophet is our leader. The Qur'an is our law. Jihad is our way. Dying in the way of Allah is our highest aspiration." Other posts seem to scapegoat Egypt's Coptic Christian minority for the Muslim Brotherhood's failure in power after one year. In fact, the Egyptian army moved only after Morsi refused to negotiate with opponents or call new elections as tens of millions of Egyptians took to the street. They felt Morsi focused more on consolidating power for the Muslim Brotherhood and other Islamists at the expense of Egypt's crumbling infrastructure and economy. Elsayed denied connections with the Brotherhood during an August news conference on the eve of a pro-Morsi rally organized by Egyptian Americans for Democracy and Human Rights (EADHR) when asked about them by the Investigative Project on Terrorism (IPT). "This is not about the Muslim Brotherhood. It is not even about Dr. Morsi," Elsayed said. The rally was in defense of democratic values and a stable Egypt, he said. "So we have nothing to do with your claims." Neither he nor the EADHR, which also prominently features the R4BIA symbol on its Facebook page, has anything to do with the Muslim Brotherhood, he said. But Elsayed also served as head of the Muslim American Society (MAS) before becoming Dar al-Hijrah's imam in 2005. MAS was founded in 1993 as the "overt arm of the Muslim Brotherhood in America," federal prosecutors wrote in 2008. "Everyone knows that MAS is the Muslim Brotherhood," Abdurrahman Alamoudi, once the most influential Muslim American political activist, told federal investigators in a January interview from a federal correctional facility where he is serving time. In a 2004 story about the Muslim Brotherhood in America, the Chicago Tribune quoted Elsayed describing Brotherhood founder Hasan al-Banna's ideals as "the closest reflection of how Islam should be in this life." Al-Banna aimed to restore the caliphate and reunify the Islamic world with sharia as its guide and the convert Egyptian secular society into a thoroughly Islamic one. According to his 50-point Manifesto written in 1936, his principles included: strengthening the bonds between Islamic nations with the interest of restoring the caliphate; establishing an Islamic spirit of governance; segregating the sexes; banning dancing; and imposing "severe penalties for moral offenses" among other things. Elsayed's mosque has a history of ties to radicals and has attracted repeated law enforcement attention over the years. Federal agents described Dar al-Hijrah as the subject of "numerous investigations for financing and proving (sic) aid and comfort to bad orgs and members." Among those bad members, American-born al-Qaida cleric Anwar al-Awlaki served as an imam at Dar al-Hijrah before leaving the United States; two 9/11 hijackers attended services there, as did Fort Hood shooter Nidal Hasan and terrorist financier Abdurrahman Alamoudi. Elsayed is named in a 1991 Muslim Brotherhood document detailing the group's plan to wage a non-violent civilization jihad to destroy "Western civilization from within." A portion of the document describes people building organizations which spread the Islamist message. "We have a seed for a "comprehensive Dawa' educational" organization: We have the Daw'a section in ISNA + Dr. Jamal Badawi Foundation + the center run by brother Harned al-Ghazali + the Dawa' center the Dawa' Committee and brother Shaker al-Sayyed are seeking to establish now + in addition to other Daw'a efforts here and there...," an FBI translation of the Arabic document says. 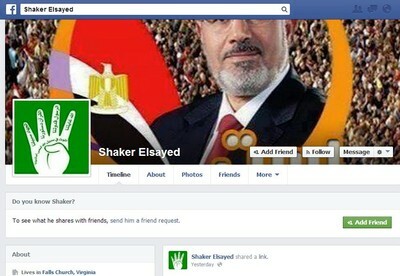 Elsayed's Facebook page isn't devoted solely to supporting the Muslim Brotherhood. It also includes a post demonizing Coptic Christians supporting the Egyptian army's overthrow of Morsi and his government. Copts have been subjected to physical violence, including the burning of approximately 80 churches, and incendiary rhetoric from Muslim Brotherhood supporters since Morsi was deposed in July. Four people were killed Sunday night, including an 8-year-old girl, when masked gunmen opened fire on guests leaving a wedding ceremony at a Coptic church outside Cairo. Copts, representing about 10 percent of the population, may be the weakest element in Egyptian society with few internal or external political resources at their disposal. But that did not deter Elsayed from setting them up as a boogeyman in Egypt's internal turmoil. He posted a video quoting the Book of Isaiah out of context, suggesting that the Copts believe they need to undermine Egypt. "This book is the main incitement to what is called sectarian strife in Egypt," the video says. "This is what the Copts teach to their children in churches every day." Copts have co-existed peacefully in Egypt for centuries. Elsayed has a record of inflammatory rhetoric. During a speech last February at an Alexandria, Va. high school, he said Muslim men shouldn't resist giving "arms for jihad" out of fear they will be labeled as terrorists. "You are a terrorist because you are a Muslim," Elsayed said. "Well give them a run for their money. Make it worth it. Make this title worth it, and be good a Muslim." Although the United States and the European Union classify Hamas has a terrorist group, Elsayed sees no problem with supporting its aims. Elsayed defended Hamas's use of suicide bombers in December 2002 remarks objecting to the media's use of the term "suicide bomber" as "unfairly" used. "Nobody who is not Muslim has any right to decide for us, we the Muslims, whose is a martyr or another. We as Muslims will decide that. It is in-house business," Elsayed said. Despite this rhetoric, Dar al-Hijrah has enjoyed a strong relationship with government agencies. A State Department web site featured the mosque in a 2009 video as a model of American diversity. In 2008, the General Services Administration (GSA) leased office space from the mosque for use in the Census. The contract paid Dar al-Hijrah $582,000, or about $23,000 per month, through the end of 2010. Days after the IPT exposed that deal, the State Department sent a class from its Foreign Service Institute – future diplomats – to the mosque to hear "attitudes and perspectives that immigrants from Muslims countries had about America before arriving and how their understandings have changed." Elsayed also has defended convicted terrorists. For example, he served as the unofficial spokesman for Ahmed Omar Abu-Ali's family after Abu-Ali was charged by American prosecutors in 2005 with providing support to al-Qaida. Elsayed dismissed the charges as "revenge" against the Abu Ali family's claim that his confession to Saudi Arabian officials was the result of torture and abuse. Abu Ali told interrogators that he was "determined to kill the president" and that he believed he "could have succeeded." He plotted to get close enough to shoot President George W. Bush or use a car bomb to kill him. Abu Ali was convicted in Virginia in 2006 of several criminal counts stemming from his status as the second-in-command of an al-Qaida cell in Medina, Saudi Arabia, including a plot to assassinate then-President Bush. Elsayed also claims that the FBI has actively framed Muslims instead of investigating terrorist operations. "Our experience here at al-Hijrah was very positive with the FBI leadership in Washington Field Office, until we found out that getting very close to the FBI came at a very serious price," Elsayed said in a January 2011 interview with Iran's Press TV. The imam made his comments referring to the November 2010 arrest of Somali-born Mohamed Osman Mohamud on charges he planned to detonate a vehicle bomb at a Christmas-tree lighting ceremony in Oregon. Elsayed's record over the past two decades has been one of a repeated defense of Islamist extremists and terrorist activities and an effort to downplay the threat they pose to Americans. His denials about Muslim Brotherhood sympathies ring hollow in view of his record. And the pictures on his Facebook page paint a thousand words.